This holiday season Faith magazine invites you to enjoy a retelling of the story of the family tree of Jesus—the Jesse tree. In the month before Christmas, the church anticipates the coming of Jesus through readings that span from the Old Testament creation story through Jesus’ birth. Jesse, for whom the tree is named, is the first person in the genealogy of Jesus. At the top of this family tree are Mary and Jesus. Depicted in church windows and artwork for hundreds of years, this visual tree of life may even have been a forerunner of today’s Christmas tree. All you need for this project is a homemade drawing of a tree. You can also make a Jesse tree by putting a few tree branches in a pot filled with gravel or sand, or using a tabletop Christmas tree on which to hang Jesse tree ornaments. Reflect on the readings and symbols of this ancient tradition. 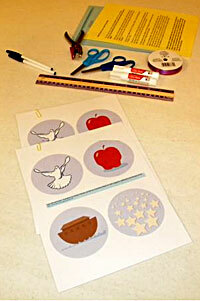 You can download our symbols on card stock, or print them on paper and glue them to construction paper or felt. Sharing the Jesse tree story is a great way to help build anticipation for the birth of the Christ child, allowing the roots of faith to take hold and grow. Designed to fit on 8.5 x 11 paper.If PDF files do not open, download the free Adobe Reader. 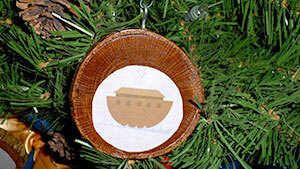 Thanks very much for your interest in using our free Jesse tree ornaments and the text we wrote to accompany the Scriptures. As always, we are pleased when anyone wants to get them into homes where they can be enjoyed, so there is no charge. We do ask, however, that you credit as follows: Illustrations by Carolyn Pikoulas and text by Anne-Marie Welsh for Faith magazine, published by the Diocese of Erie. Select one of the "large ornaments"
Note: If you don’t get what you want when you paste, try ALT + PrtScn for step 2 instead. You will have to use the “crop” function in PowerPoint to carve off the extra stuff that will come along with the print screen. Thank-you e-mails from around the world! Thanks so much for providing the free materials for the Jesse Tree. The first time my family to do this kind of activity and it makes advent more meaningful to us! Thank you for the ornaments and the reflections. This is the best and most consistent set I have ever used. Last year, my husband made a set of wooden Jesse Tree ornaments for each of our children. They will be treasured and used for years to come. I just wanted to thank you for having the Jesse Tree symbols and readings available to us! I used it last year with my family and my kids really enjoyed it! We laminate them and hang them on our Christmas Tree during Advent. THANK YOU for the beautiful ornaments for the Jesse Tree! I will be using them with my 8th grade Faith Formation Class this coming Sunday. The reflections and Scripture references will be a good source for our Scripture Search! Thanks for sharing this very special way of helping young people become familiar with the very human family and faithful God, that gave us Jesus Christ! We truly enjoyed making the Jesse Tree using your illustrations and text. The Christian Formation Committee of Our Lady of Perpetual Help in Salem, Virginia sponsored the Advent Faith Festival and we had 10 families signed up for it. The Committee provided all the materials. We collected tree branches and empty “Pringles” cans and spray-painted them silver. We scheduled the event on a Saturday morning and had homemade soup and grilled cheese sandwiches and, of course, dessert for everyone to enjoy. All had a great time! Thank you very much for sharing your Jesse Tree. I came across your symbols last year when working in Zimbabwe. I was delighted with them. This year I am based in Zambia and have started on our Jesse Tree. Thank you for the inspirational symbols. Wishing you a blessed Advent. Thank you very much for sharing this. I have a variety of devotional books using the Jesse Tree, but they weren’t adaptable to my ministry here with 133 long-term care residents and rehabilitation guests. Our residents range in age from 40’s to 105. We’re using a large version for use in our Ecumenical Chapel and making smaller copies that residents can use in their rooms for their making their way toward Christmas. And I’m having a young adult who is artistic and needs to do community service create the large Jesse Tree and prepare the symbols. Blessings for sharing this in the spirit of all true Christian Educators who help one another as fellow members in the Body of Christ. Shalom, Salaam, Peace be unto you all. I am the 6th grade religion teacher at Our Lady of Perpetual Help in Germantown, Tennessee and I wanted to thank you for the beautiful Jesse Tree images and reflections. I have been looking for a simple Jesse Tree project that my class could do with their "Kindergarten prayer buddies" and your symbols are perfect. I have copied the smaller images onto card stock and we will then glue them onto larger circles and each student will have a symbol to decorate and then add to our tree. Since we do not have to draw each image and then color and then decorate we now have more time to read the bible stories and discuss Jesus' family tree. Thank You! We run an afterschool club called the Parish Pals in a small village called Todmorden in the UK. We are preparing our Jesse Tree activities for the club which is this evening and have written our own booklet which we're printing now. We're happy to send a final version if this is of interest. I wanted some pictures to show the children and found your wonderful Jesse Tree ornaments - what a gift. We have around 26 children every Thursday evening from 3.30 - 4.30 and they are going to be making symbols for the Jesse Tree which we adorn during a family mass on 16th december. Thank you for your lovely images, we will take some pictures and maybe we can post them to you. We are using the beautiful ornaments as part of an Advent Celebration December 2nd with families from Worldwide Marriage Encounter (WWME). Each family will have a tree to take home. Attached is a picture of our sample tree. My husband, Joe, cut it out of 1/4" board and we used tiny nails to hold the ornaments. The ornaments themselves were best printed out on cardstock. We used a little foam glue to put them on colored circles of foam and taped a ribbon loop on the back. The ornaments are so beautiful Thank you to Ms. Risinger for designing them. We want the trees and the reflections to be used by the family year after year. Thank you. Thank you so much for taking the time to create the Jesse Tree Ornaments. I teach 6th grade CCD at Holy Cross Church in Trenton, NJ and they are just what I was looking for! I have been teaching 6th grade for 10 years now and work a 40 hour week at "my real job." I have ideas of what I would like to do in my class room but run into problems implementing them as it takes time to research each idea. When I find a website that has "exactly" what I want — I want to tell you how much I appreciate your effort providing something I do not have the time to do myself. The class will be making their own personal Jesse Tree with your ornaments. I am looking at your site and am impressed with the large Jesse Tree decorations you have. We are working on a religious education programme for national schools under Anglican management here in Ireland and I have been searching for suitable images to use in the lesson about Advent. This lesson includes instructions on the making of a Jesse Tree and the stories behind the various images. Last year I printed out the smaller ornaments and the family decorated them with glitter glue pens, highlighting some of the drawings. We then gathered nightly around our Jesse tree and took turns placing the daily ornament on as dad or I read the reflection. The kids looked forward to it all day. My name is Kathleen and I'm the mother of two boys (ages 18 months and 4 years). We live in the Bronx in the Archdiocese of New York. I was looking online for something to do during Advent for the boys to begin to teach them about the real meaning of the season and stumbled upon the idea of a Jesse tree. I'd never heard of that before and found some of the kits expensive and other ideas time consuming. THEN I found your website where I could download and print everything we need. Thank you!!! We will tape green garland on the wall of the hallway where our bedrooms are and each evening for prayer, we will, as a family, do the Jesse Tree. I appreciate your doing this for a busy mom who wants to chatecize her children! I haven't used the Jesse Tree yet, but I am so excited, that I just had to write to you. My family is part of a 16-family Catholic home school group in northwest Ohio. A few families have a tree already, but others do not. We wanted to get together and make ornaments for each other’s tree, but we simply ran out of time. I found your site on the internet (via Google Search) and passed it on to the group. Your downloads have made it possible for everybody in our group (32 adults, 60+ kids) to have a Jesse Tree and beautiful readings to go with it each day. Thank you so much for making this available free of charge. May God richly bless you! I am in the Archdiocese of St. Louis, but wanted to thank you for posting the Advent reflections. We will be putting up a Christmas tree (with white lights and no ornaments) on the first Sunday of Advent, and each day during Advent, putting on the tree one of the Jesse Tree ornaments, reading the accompanying Bible story and reflection. I purchased round wooden disks from a local craft shop that our children will be painting the Jesse Tree figures on. I'm really excited to use our Christmas tree in this way, as we usually do not put our tree up until a few days before Christmas. This way we can enjoy the tree during both Advent and Christmas. 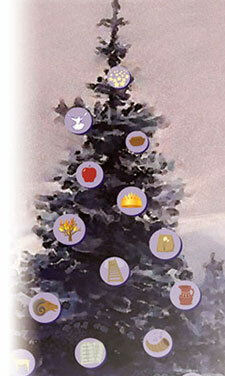 Thank you for providing the illustrations of the ornaments for the daily scripture readings. I will be using this information when our parish gathers on Nov. 25 for the Whole Parish Catechesis Program devoted to Advent...its symbols and ceremonies. I am the volunteer librarian for our parish library. I am making a Jesse tree with the ornaments and a posting of where families might be able to find your patterns! Thank you! 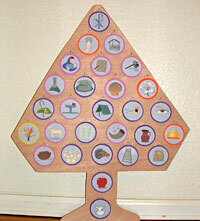 Thanks for putting printable Jesse Tree symbols online and also the reflections. I will be using these with my sixth grade homeroom this year and we will be putting the symbols out in the hallway for all to see. Hello Faith Magazine! What a delightful Advent project you have brought to our parishes and families! 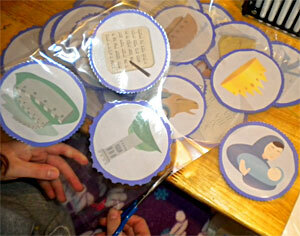 We plan to use the printed designs and their reflections with our religious education program. Each grade will be given a symbol to place on our Jesse tree. The Jesse tree has been created out of brown craft paper and green construction paper hand cut-outs, on one wall in our RE building. As the weeks go by, students will watch it grow and learn about Jesus' Family Tree and God's great plan of salvation. Our parish will also utilize the ornaments to be laminated and hung on a tree in our new gathering space, thus connecting our whole parish to this wonderful Advent journey. We are blessed to have this new area for our parish to gather before mass and to have places to display 'visual lessons' in faith! (The reflections will be posted by the tree with encouragement for people to visit your web site!) It could very well become a storytelling center for Advent. Thank you for sharing this wonderful gift!